I spent most of my time working on a cute little cartoon Robin character which made a nice change from the more serious things I’d been animating for years. It was really bouncy and squashed beautifully even though the geometry wasn’t all that sophisticated. The design was very round so it was like animating a ball with personality. I moved on to another project after this, but it was the last proper piece of animation I did for Rare before finally saying my good-byes after seven and a half years. I later discovered that my animation was used in Viva Piñata 2 rather than in the expansion packs that were intended for the first game. 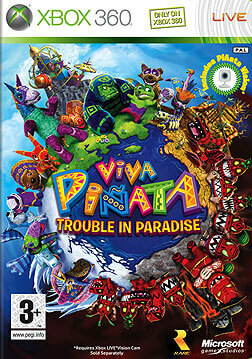 Viva Piñata has spawned an entire franchise now with an animated TV series and a spin off game.